The Toowong Process is a new technology addressing the globally significant issue of arsenic and other deleterious elements in mine products. Currently many mines have no option but to ship arsenic-bearing concentrates to smelters, often on the other side of the world, and incur the associated penalties. The Toowong Process is a new hydrometallurgical technology, developed by the team at Core Resources, that enables operations to remove these deleterious elements at the mine site prior to shipping the cleaned concentrate. The benefits for operations, smelters and the global environment are enormous. The Toowong Process achieves over 90% arsenic & antimony removal from many copper, lead and nickel concentrates. The patented Alkaline Leaching (AL) process selectively leaches arsenic and antimony. Copper, lead and nickel are not solubilised (dissolved) in the process. 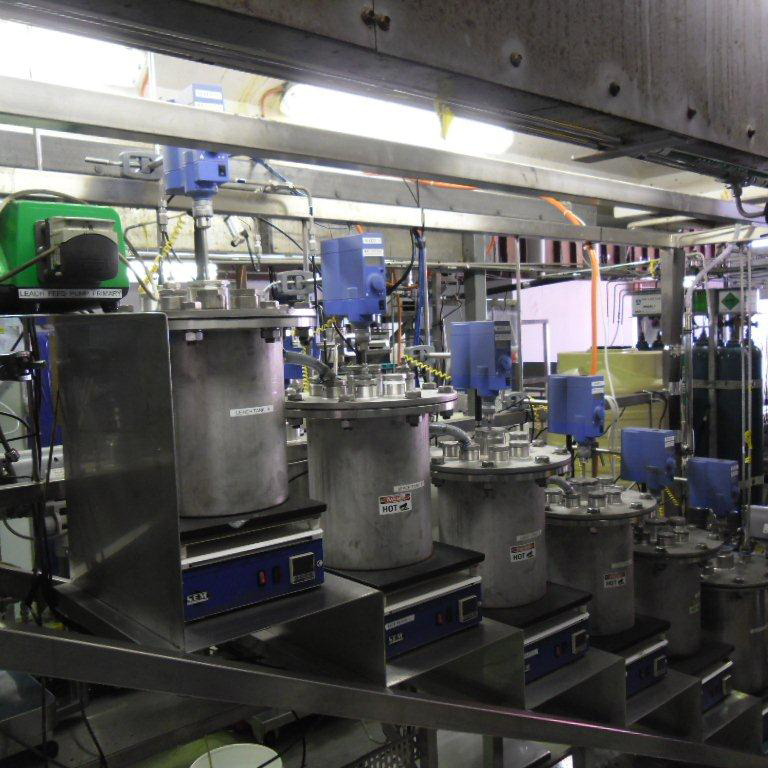 The final product from the process is a cleaned saleable copper, lead or nickel concentrate – no expensive downstream metal recovery circuit is required. The leach reagents are mostly regenerated and recycled, minimising the operating costs of the process. Environmentally sensitive elements are recovered and concentrated for disposal using conventional practices. This enables arsenic to be managed on site at the mine. Arsenic & antimony values can be returned to their native environment at the mine site. Highly effective for high arsenic grades – suitable for treating whole of concentrate or a high arsenic bleed stream from a processing plant. The process also has application as an antimony recovery process for antimony mines. The process has been extensively tested, including a $4.5m 34 day pilot plant operation on Tampakan concentrate, successfully reducing the arsenic content from 1.1% to 0.1%. Copper operations globally are facing increasing challenges with arsenic. 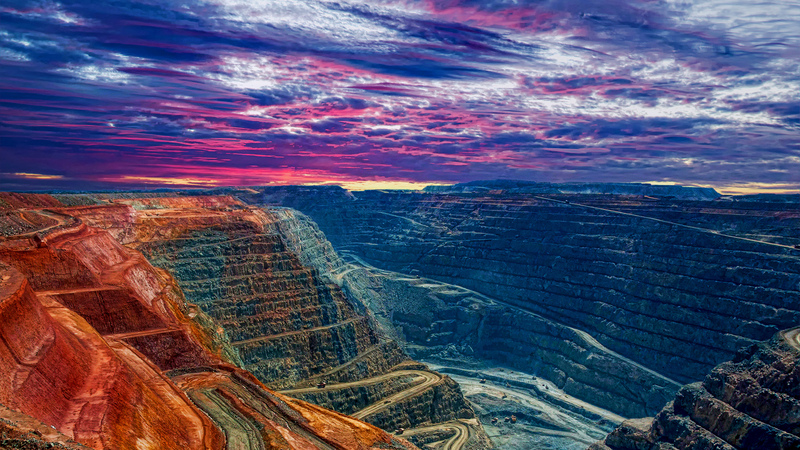 As clean copper ore bodies are depleted, increasingly dirty ore bodies – with higher grades of deleterious elements – are being studied and mined. Previously, mining companies would reject these ore bodies in favour of the better quality ore bodies available. The increasing presence of arsenic in mine products is a sign of the global challenge facing the copper industry. Arsenic has huge environmental and health issues for the smelters who receive these products, with many smelters situated near high density populations. Globally, the smelter industry is responding to this by restricting the level of arsenic they will accept in mine products. In 2006, China set a bench mark maximum of 0.5% As in concentrates; other countries have reduced the limits further. It’s been reported that since 2014, arsenic in concentrates has exceeded the global smelting capacity to treat it. 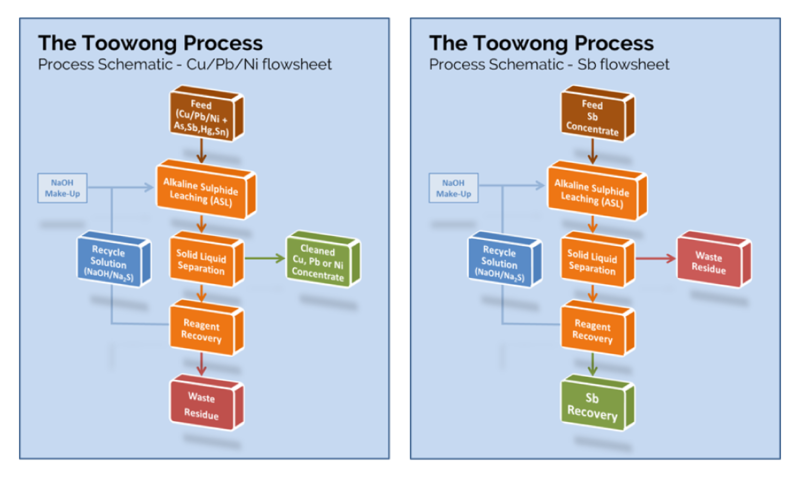 The Toowong Process enables operations to manage arsenic in ore bodies at the mine site. The product from the Toowong Process is a cleaned concentrate that can be shipped direct to smelters. Using the Toowong Process, arsenic can be fixed in an environmentally stable form at the mine site, potentially more environmentally stable than its native original form. The benefits of this are enormous – instead of shipping arsenic often across the globe to a densely populated area, arsenic is stored at its original site. At the heart of the process is a patented Alkaline Leaching (AL) step that solubilises key penalty impurities or metals. The chemistry of the leach leaves the copper, lead or nickel in solid form in the concentrate, eliminating the need for downstream recovery of these metals. For antimony applications, the final product stream is the AL leach liquor, which can be passed to conventional downstream metal recovery. The Toowong Process is a significant breakthrough and departure from historical understandings of arsenic leaching, which have traditionally required large and expensive quantities of sulphide reagent addition and management of large sulphate waste streams. In the Toowong Process, Core has developed process chemistry that is self-sustaining, allowing most of the reagents to be generated from the concentrate in situ in the leach, or recovered downstream and recycled to the AL step. Significant investment by Core in chemical analysis instrumentation and methods has supported this breakthrough. A schematic representation of the process is shown right for Cu/Ni applications and for Sb applications. 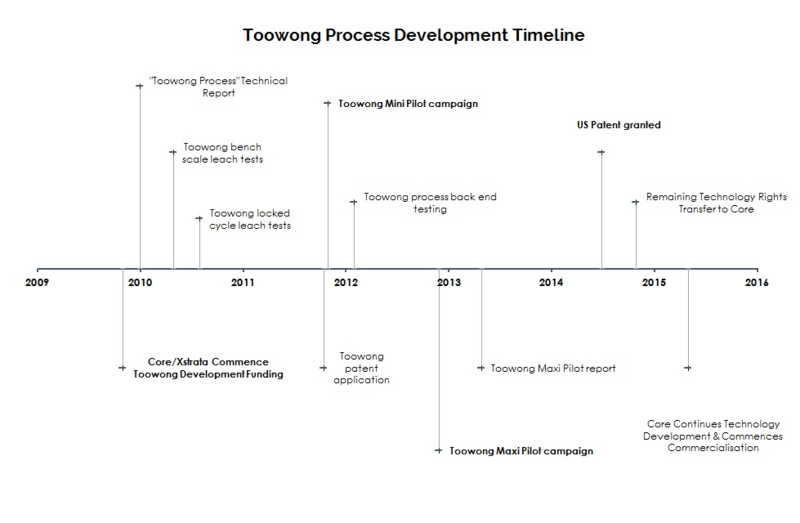 In 2012 Core carried out a $4.5m pilot plant demonstration of the Toowong Process. Over 34 days, 1.2 tonnes of Tampakan concentrate was treated with the process. Arsenic removal of 95% was achieved, lowering the As grade from 1.1% to 0.1%. The product from the pilot plant was a cleaned copper concentrate suitable for sale. The pilot plant was run in full recycle mode, to demonstrate the robustness of the process in a real-world style application. For more on this pilot plant trial watch the video below or see this page. In 2009, Core was approached by Xstrata to develop a process solution for the high As levels of the Tampakan Project concentrates – this was the genesis of the Toowong Process. The development has continued since then, with extensive bench and pilot scale testing. The Toowong Process has patent and IP protection under International Patent WO 2012/051652 “Method For Treating Arsenic Containing Material”. In addition, considerable proprietary IP and know-how not fully disclosed in the patent remains with Core Resources relating to reagent and metal recovery as well as residue stabilisation processes. These are subjects of potential patents in the future and have been tested at bench and pilot scale. Having been demonstrated in multiple testing scenarios, the Toowong Process is now at the point of commercialisation. Core is in negotiations with parties currently interested in applying or acquiring the technology. and many other sulfosalt minerals. Often these minerals also contain deleterious amounts of Hg and Sn, which can also be removed by the Toowong Process. The Toowong Process has a wide range of applications for arsenic, antimony, mercury or tin bearing concentrates. It has been developed for projects requiring removal of deleterious elements, and for projects where those elements are the target metals of value (e.g. antimony projects). The process can be investigated for treating entire concentrates or for treating a high arsenic flotation product. To find out more about the Toowong Process, or to discuss its suitability for your project, contact us today.